One handwritten note on a scrappy piece of paper hung above my desk throughout my university years. 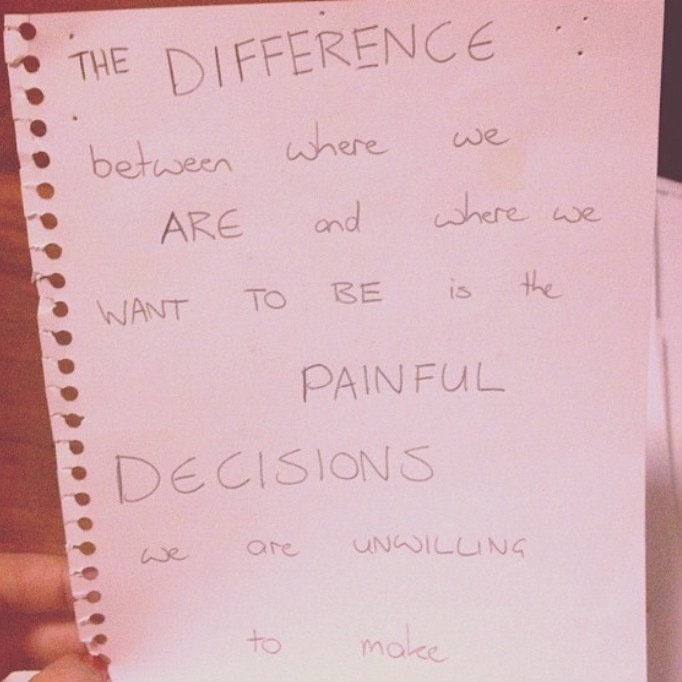 The difference between where we are and where we want to be is the painful decisions we are unwilling to make. It’s as true for me today as it was back then. Certainly, it reminded me then of the importance of choosing to spend the necessary hours studying, learning and writing. To decide to say no to too much socializing or sleep. But even more so, it reminds me, still today, of other important decisions I need to make, and keep making. The decisions to let go of things. The decisions to actively embrace things. To make the difficult and even painful decisions, in a hundred small ways, over and over, to shape my thinking in ways that will serve me well. To count myself in, not out. To prioritize relationships. To exercise discipline in my habits and speech. What would the answer to that question be for you?